I’m not going to lie -- I’m a geek for Gama-Go. 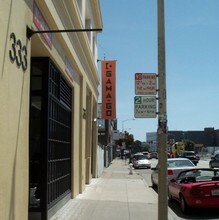 I’ve been waiting for Gama-Go’s first retail store to open for quite a while. Rarely do I get this excited about a new store, but when they confirmed they were opening a retail space in SOMA on 8th Street at Folsom just downstairs from their old warehouse space, I couldn’t wait to get there. I know I’m not alone. If you don’t believe me, wait in line with the hordes of fans on one of their warehouse sale days…in the rain. And again, on the first day of the store opening there they were waiting in the rain. 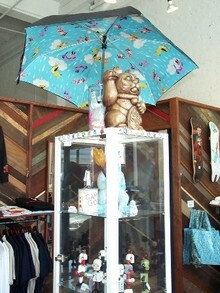 It’s a good thing Gama-Go sells umbrellas, like the light blue Furry Flurry ($32). If you already adorn your body with images of one of Gama-Go’s many characters such as Deathbot, Tiger Lily or Ninja Kitty, then I’m preaching to the choir. If you haven’t yet covered yourself in a Gama-Go design, I suggest you at least check out their colorful compositions, which I think can be appreciated on their own. Each Gama-Go character seems to have a personality, most loveable, yet mischievous, and sometimes even a little sinister. You don’t often find fun prints like these for adults that are unique and playful, without being juvenile. Owners Tim Biskup and Chris Edmundson’s previous experiences at a toy company definitely influence their whimsical designs. In fact, they originally wanted to start a toy company. But instead we are wearing their clothes instead of playing with their toys. In 2000, Tim and Chris brought their friend Greg Long into the fold. Their first t-shirts were screen-printed in the basement of Greg's house, where they all continued to work out of for the next three years. Tim, Chris and Greg first started with just six designs on t-shirts. Over the years, they’ve branched out with wallets, messenger bags, housewares, stationery, books, art and even toys. So far, they’ve designed over 700 unique and collectible t-shirts and hoodies. In fact, everything they produce is limited. Once the design is sold out, they don’t make any more. But enough about that -- if instant gratification is your thing, the retail store is for you. Of course, you can find Gama-Go products online, throughout the city at many boutiques, as well as half the states in the country and various international locations, including Europe and South America. The new retail space is stocked with men’s and women’s jackets and shirts. You can find their women’s tees with designs such as Jellyfish and Ninja Kitty Cherry Tree ($28 each), men’s hoodies such as the turquoise Guitar Hero ($84) and a men’s knit thermal long shirt with the Battle Royale scene ($32). There’s even a line for kids up to age three called Gama-Goo. Their kid-friendly tees feature designs such as Critter Ark and Chicken ($20 each). 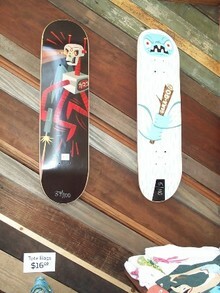 If you don’t want to wear Gama-Go but you like the designs, there are Gama-Goods, such as a Hot Hits Trivet shaped like a 45 record ($8), limited edition wooden characters like Deathbot ($22), skate decks ($100) and limited edition artistic prints ($50-$100). There is also a line of small messenger bags with designs such as Cassette Cass ($44), large ones with Sketchy Delight ($88) and bacon wallets ($24). Smaller yet just as satisfying are goodies like magnetic coasters with pictures of exotic dancers from decades past ($10), a pack of 42 Ninja Kitty stickers ($5) and postcards ($13). Over the years the prices have jumped, but deals can still be found at their wildly popular warehouse sales that I mentioned above. In addition, they often have online deals such as hoodie roulette, where they’ll send you one of their limited edition hoodies, but you won’t know which one ($40). As it goes with many things, we don’t often want what we deem cool to be co-opted by the masses. But for me, I’d much rather watch an army of Gama-Go fans parade down the street than a bunch of people in Ed Hardy.